Without the benefit of knowing the artists, the full intent of the work, or the context or ideas that inform the artists’ decisions, as a juror, all I can do is rely on my eye and curatorial experience to select objects that are, in my opinion, the most compelling and which deserve closer examination. 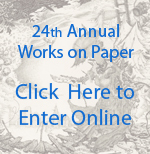 This is often a very difficult task especially when the field of entries was as strong as is this year’s 21st Annual McNeese National Works on Paper Exhibition. Initially presented with images of several hundred works on paper made by artists from across the country, I narrowed the group to a still hefty exhibition of forty works which I felt were particularly well conceived and executed. These exceptional works demonstrate the high level of quality and ambition of works being made on paper by artists from near, far, and some areas in between. A quick look through the list of participating artists proves that strong works are being made from coast to coast, from large metropolitan areas like Los Angeles, Brooklyn, and Chicago to smaller, less well-known regional artistic centers like Topeka, Tuscaloosa, and Little Rock, among many others. Thus, the exhibition serves an important purpose—as a platform for showing us works from just about everywhere, it shows us how artistic innovation and expression knows no borders, and perhaps introduces us to artists and works we may not have had an opportunity to see before. I am, personally, delighted with the opportunity to have had the chance to become familiar with them. As is true of most juried exhibitions, the styles and themes of the works on display in this year’s National Works on Paper Exhibition run the gamut. However, what seems to unite them all, in my opinion, is a sense of sincere engagement with the world we live in today. Some artists seem to be responding to the political and social issues of our times, others look to the body and how it is represented through history or mass media, and still others delve into the realm of abstraction as a way of expressing emotion and meaning. Many address these issues directly, while others veil their works in fantasy, fiction, or historical reference. Together, these works speak volumes about who we are as a society and culture. At the same time, these works also demonstrates a keen understanding of formal issues, including the use of light, color, and composition. One of the most interesting aspects revealed to me in this group was how these particular artists have pushed the boundaries regarding paper’s materiality and use—demonstrating once again how important paper is to every artist’s imagination.